Here’s quite a different leaf that I saw at the Lady Bird Johnson Wildflower Center on February 3, 2013. 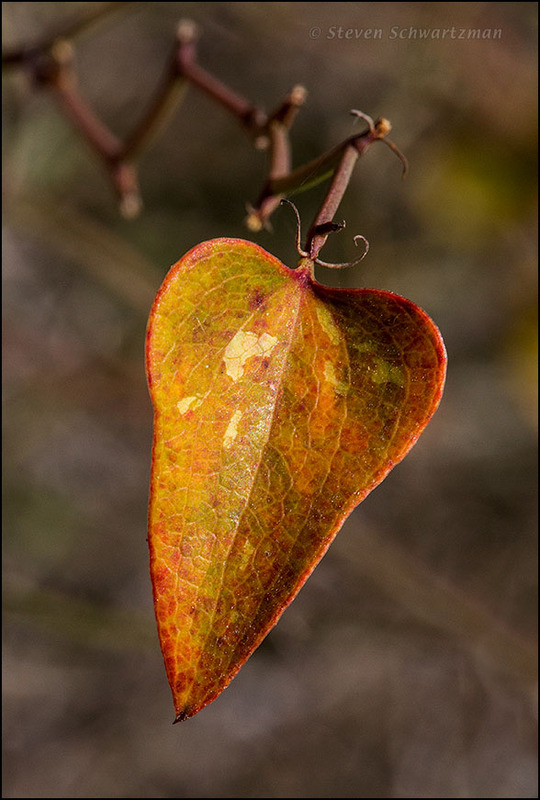 It’s from a greenbrier vine, Smilax bona-nox, a species whose leaves can turn colors in seasons other than autumn. The mottling that you see here is also typical of this vine’s leaves, as is the prickle at the tip. Hey, guys, I saw it that way too. That’s the first thing I saw, too – the expandable stem. I see a lot to enjoy in this photo, Steve. I love the color, and the angles into the depths, contrasting with the curves. Hi, Melissa. I’m glad you enjoyed the colors and the geometry of the image. I’d forgotten about this picture until I went back through my archives. That is fun, isn’t it? Every once in awhile I dig through the canvases stacked against the wall and come across surprises, good and bad. Such wonderful use of color, texture, detail, shape, and lighting; a very enjoyable image. Thanks, Charlie. You can write comments like this one as often as you like.